iNO One Easy "My First Android" Dual Sim Dual Core 3G Smartphone. ~ All Android Smartphones Mobile Phones Tablets Review Price. 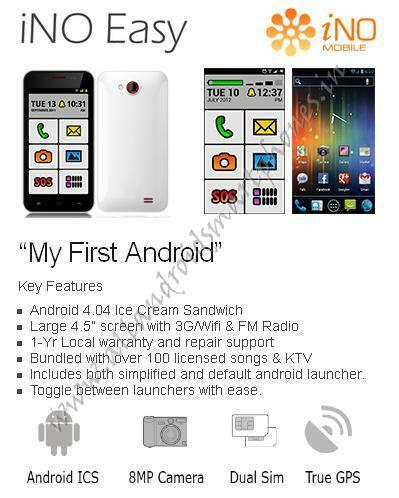 iNO One Easy "My First Android" Dual Sim Dual Core 3G Smartphone. iNO One Easy is a dual sim dual core 4.5 inch Android Smartphone with 3G support. The smartphone works at a 2G frequency of GSM 900 /1800 and at a 3G frequency of WCDMA 2100. The dual sim camera smartphone doesn’t support 4G network. The phone uses Android OS 4.04 Ice Cream Sandwich with 4 GB Internal phone memory & 1 GB DDR RAM support. The phone doesn’t support external memory card slot via microSD card. The display screen used is 4.5 inch QHD 16M colors capacitive multitouch screen which gives a resolution of 960 x 540 pixels. The Android touchscreen dual sim camera phone supports 3.5 mm Audio Jack for head phones, Loudspeaker & Flashlight. The smartphone supports active dual sim feature. The phone comes in only white color. Explore iNO Easy My First Android Smartphone with 3G Dual Sim Dual Core 4.5 inch screen support Features, Specifications, Images, Photos, Comments, Review & Price in India in 2013. The smartphone uses standard battery Li-ion 1750mAh for better battery backup. The phone uses a Dual Core 1 GHZ processor for better computational power and quick response. The phone supports WLAN Wi-Fi IEEE 802.11 b/g, Standard Micro USB Port, Bluetooth v 2.1, FM Radio for music entertainment and TRUE GPS. The phone uses a 8 MP Rear Camera with flashlight support and 2 MP front camera for video call. The smartphone includes both simplified and default android launcher. We can toggle between launchers with great ease. The phone promises 1 year local warranty and repair support. The phone comes with bundled with over 100 licensed songs & KTV songs. iNO Easy makes it easy for anybody and everybody to enjoy enabled living with customised content and user interfaces. Also check Micromax A115 Canvas 3D Dual Core 3G Android 5 inch Phablet Smartphone Features, Specifications, Images, Photos, Comments, Review & Price in India. 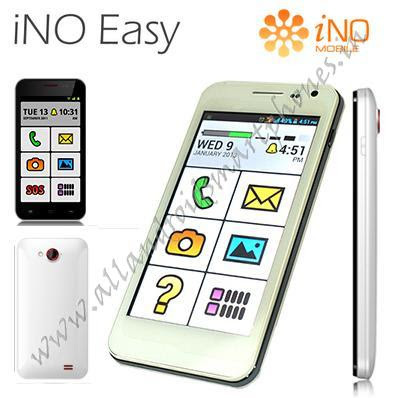 Features and Specifications of iNO Easy My First Android. 134.5 x 67 x 9.9 mm. The Price of iNO Easy 3G Dual Sim 8 MP Camera dual core CPU Android Smartphone is $299 only.